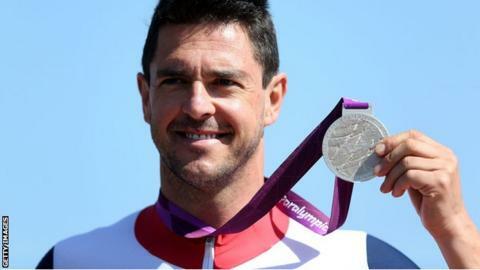 Welsh cyclist Mark Colbourne has won his third medal of the London 2012 Paralympic Games by winning silver in the C1 road time trial. The 42-year-old finished 12.94 seconds behind German gold medallist Michael Teuber, the same man who beat him in the 2011 World Championships. Colbourne, who broke his back in an accident in May 2009, had already won a gold and silver medal at the Games. Liz Johnson added to Wales' haul with bronze in the SB6 100m breaststroke. The defending champion set a new Paralympic record of 1:41.09 in qualifying for the evening final, but then saw Great Britain team-mate Charlotte Henshaw lower the mark to 1:39.64 in the second heat. That record was broken again in the final as 14-year-old Ukrainian Viktoriia Savtsova beat both GB swimmers to the gold in 1:39.19, with Henshaw (1:39.16) second. After winning 4x100m relay bronze, Jenny McLoughlin failed to add an individual medal when she finished fifth in the final of the T37 200m. She set a new personal best of 29.73secs in her heat to qualify as third fastest. In the sailing in Weymouth and Portland, Stephen Thomas enjoyed a profitable day in the three-person Keelboat (sonar) category as he moved up to the bronze medal position after 10 races. The final race to decide the medals takes place on Thursday. Colbourne's silver and Johnson's bronze on day seven takes the total medal haul for Welsh athletes to 10, with double field athletics medallist Aled Sion Davies the other competitor to take gold. Governing body Sport Wales had set a target of winning at least 14 medals. Sitting volleyball quarter-finals: Sam Scott, James Roberts (GB v Iran).